When Will Wages Keep Up? There is a lot of news these days about the red-hot Colorado economy. Unemployment may be down, but wages are stagnating. Inflation, largely related to higher housing costs, is also increasing faster than wages can keep up. As good as the economy is, many Coloradans are being left behind. As of 2016, half of all Coloradans were working for wages that were less, after inflation, than what they were in 2000! You might think that given how low unemployment is in our state and the difficulty finding workers for some jobs, that wages would be going up faster in order to attract workers. While that is happening in some cases, wages for most people are barely budging, certainly not enough to keep up with rapidly increasing costs. 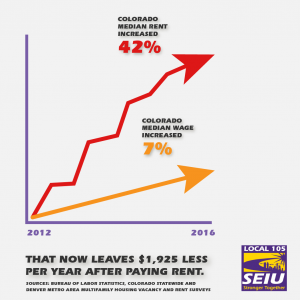 Unfortunately, there are those in the Colorado legislature who do not understand how hard it is to find affordable housing on the average wages in our state, and this problem is worse in some places than others. The Front Range Metro Area, which includes the areas around Denver, Boulder, and Fort Collins, has experienced some of the highest increases in housing costs in the country. Higher housing costs push people out of their communities and make it more expensive to get to work– further eating into already inadequate wages. It is more important than ever for people to work together to make sure that legislators represent the interests of the many over the interests of the moneyed. Paid for by SEIU (Service Employees International Union) Colorado IEC, Lauren Martens, Registered Agent, and by SEIU COPE, seiu.org. By providing my phone number and email address, I understand that SEIU, its locals and affiliates, and iAmerica Action may send me emails, may use automated calling technologies and/or text message me on my cellular phone on a periodic basis. You can unsubscribe any time you like. We will never charge you for text message alerts, but carrier message and data rates may apply. Text STOP to unsubscribe.